Our stunning third floor has been dedicated to the life and work of Andy Warhol. 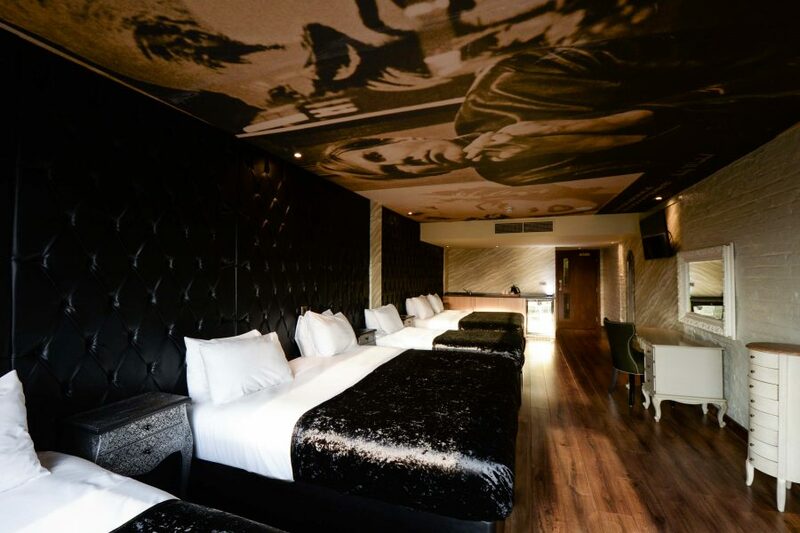 A master in all forms of creative outlet and this, the room inspired by his most well-known catchphrase, is a stunning Liverpool hotel room unlike any other. Sleeping up to six guests in comfort and luxury the Famous for Fifteen Minutes room comes complete with all the entertainment necessities such as a large flat-screen TV and Bluetooth multimedia sound system. There’s also a chic bathroom that has indulgent features such as the double whirlpool bath and waterfall shower. Making sure you don’t want for anything there’s even a modern kitchenette with a large fridge to store food and drinks and a kettle for your morning cuppa. 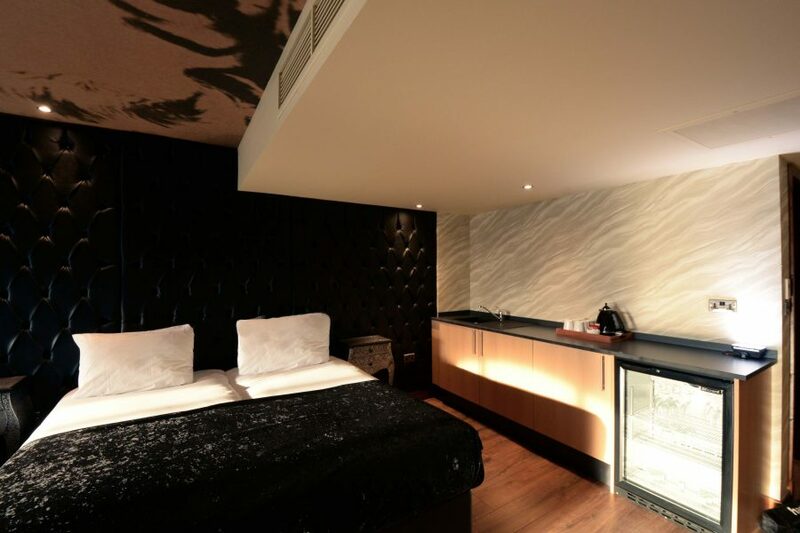 Arthouse Hotel is ideally located to give guests instant access to the best nightlife, shopping and dining venues in the city guaranteeing you a visit to Liverpool you’ll remember for much longer than 15 minutes. Definition of Fame: the state of being known or recognised by many people because of your achievements or skills. This was once what it meant to have achieved fame, however in today’s society being famous isn’t necessarily a recognition of achievement or skill. Merely a lasting presence on social media outlets, reality TV or in the press. Andy Warhol coined the phrase “In the future, everyone will be world-famous for fifteen minutes” which was then written into a program for a 1968 exhibition of his work. It is, however, understood that inspiration for the phrase came from photographer Nat Finkelstein two years earlier. Today the phrase has been used in many ways since and has been adapted to suit a host of alternative messages that contradict its original meaning. The phrase essentially sums up Warhol’s aesthetic in that his fame is now everlasting but was built upon the concept that it was so easy to achieve. His manipulation of celebrity and commercialism into controversial works of art gave him a platform of fame that was found using other existing artists or famous concepts. The way we rank the subjectivity of fame is ever changing, once only a phrase associated with talented actors, musicians and the odd socialite and aristocrat. The term fame can now be applied to anyone with more than 1000 Instagram followers. The fame game is a tough game to play and not everyone can play it well. The phrase “famous for 15 minutes” could be interpreted to mean those that cannot survive being famous for long periods of time. People who once aspired to become famous but now resent it. Fame is a fickle thing and can be influenced through so many different outlets today. People can become famous simply by the manipulation of tabloid journalism, taking the everyday moments of well-known people’s lives and turning them into a media circus prolonging an individual’s presence in the limelight for as long as possible. Not everyone can endure fame but many can achieve it in today’s fast-paced multimedia society. It is exactly this that turns Warhol’s one off remark into an accurate prophecy. Such a powerful phrase with so many different connotations was bound to be utilised in other works of art as well. Albeit in different formats altogether. As far back as the Elizabethan era, a saying existed that basically held the same meaning as Warhol’s “famous for 15 minutes”. The expression “nine days wonder” referred to a novelty that loses its appeal after a few days. This phrase can be traced back to the poetry of Charles, Duke of Orleans as he wrote from his captivity after a battle in 1465. Fast forward 500 years to present day and we are in an age where “everybody will be famous to fifteen people”. This saying was brought to us from David Weinberger and was likely inspired by the rise of our individual online presence. Even famous street artist Banksy has put Warhol’s saying to good use. Using the expression to pass on his own powerful message about today’s society. His work shows a TV screen with the message “In the future, everyone will be anonymous for 15 minutes”. A flip on Warhol’s original meaning depicting the fact that everyone today is famous to somebody but anonymous to no one.